For this post I decided to do a vlog. There are a few reasons for this…1) I was getting ready to leave on vacation and vlog’s are quicker than writing, formatting and creating a blog posts, 2) Audiobooks make it really hard to sound literate because spelling mythical creatures names when you’ve never seen them and you’re already not a great speller…um yeah…really difficult. Sigh. And 3) I just really like vlogs and wanted to try out captions….oooo….ahhhh! So, here’s my vlog! Hope you enjoy! Oh and you might notice my hair is A LOT longer in this vlog than the last one…that’s because this one was actually filmed a couple weeks ago and well, I got sick of my hair and chopped it all off. Woooot!!!!! So happy you gave it a chance even though you were a little fed up with the genre! But… wasn’t this one so soooo fantastic? Hearing you so excited about the narration, I’m so going to get the next book as a audio! YES! Absolutely fabulous! Love this book! Absolutely get anything with Kristine Hvam. She is phenomenal! 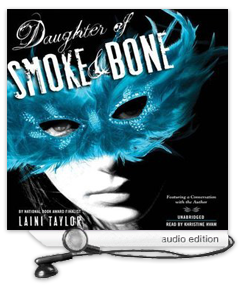 LOVED Daughter of Smoke and Bone! I read the book, I’m not an audiobook fan at all, but Laini Taylor is amazing:) I loved how Karou was strong in terms of being a fighter and loving her place in her unique little family, but also sensitive in terms of that douche of a boyfriend she broke up with. The deeper social and cultural commentary is so so valid. I love how she did it in a way we all got, in a way we couldn’t decide who was right or wrong. Yes, loved the setting of Prague! Gorgeous and Laini did a great job describing it. Wouldn’t it be cool if in another book we get some of Karou’s drawings so we actually see everyone? No problem! That would be so incredibly awesome! I also just now listened to/read this book and LOVED IT!! I thought it was so unique and imaginative, and you’re totally right, the narrator was terrific. Great review, Heather!! *blush* What an absolutely sweet comment! Thank you so much! Totally agree! =) It blew my mind. I agree the narrator was fantastic! She is my favorite of all the audiobooks I have listened too. I haven’t read the Iron Fey series yet, but I will be for a challenge this year. I may go back and listen to them also since they are by the same narrator. Zuzana was definitely my favorite secondary character. She was so fun and I loved the personality in the voice from the narrator. The views of the two different worlds was great and when the book ended, I wanted the next book right then. Great review! Oh that’s not good at all! I’m so sorry that the German translation wasn’t good! Yes, perhaps try it in English. That might help! =) Thanks for commenting! One of my FAVORITE. BOOKS. OF. ALLLLL. TIME. Laini Taylor is mind-blowingly talented. While I was reading this book I don’t believe my jaw left the floor or my emotions were in check, until at least a week later. It is just amazing and I cannot wait for Days of Blood and Starlight. I have no doubt it will be amazing, and maybe even more so, than DoSaB. If that is even possible. With Laini, there is absolutely no doubt it is possible. Thanks for the vlog. Usually not a fan, but I can take 6 minutes. Usually the ones I run across are like 9000 minutes, and I have no patience. Ha! 9000 minutes…I know, right?! You’d love our City of Lost Souls vlog then…I think it’s 15 minutes long. =P but we just had so much to say! I haven’t listened to an audio book yet, the prices scare me and I’m afraid I would quickly get distracted. I bought this book for a friend due to all the raving reviews but my friend said that she didn’t really like it. I still want to read it, the synopsis is so intriguing and I love the way you describe the characters. I’m so happy there’s unexpected twists, I love books that surprise me. Can’t wait to read this. Awesome review btw. Thank you, Isa! =) I hope you love it! I think it would be great even without it being an audio book. I’m not a huge fan of audio books either. I am super picky about narrators (Kristine Hvam just happens to be really awesome). But I knit and I have kids (which means I fold A LOT of laundry and prepare a lot of meals) so audio books are great for those times when I can’t be reading with my eyes. =) Let me know what you think when you get around to reading it!